The backstory to Norwegian electronic duo, Frost's new 'Radiomagnetic' album sounds like the start of a horror film. 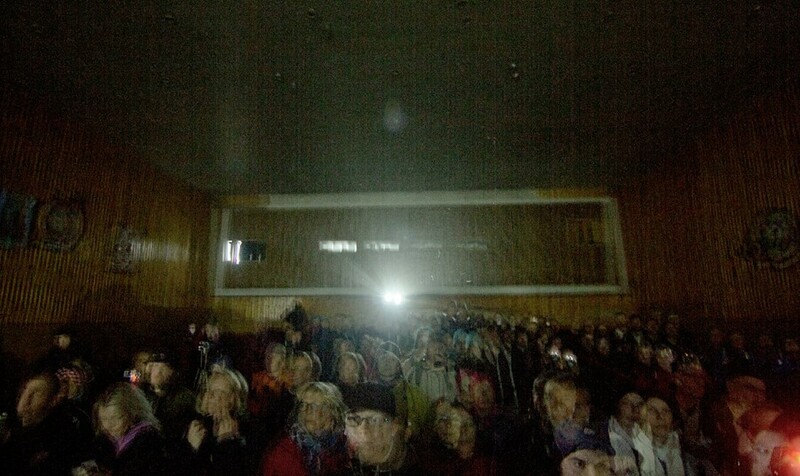 After receiving a mysterious cassette containing 'ghost' radio signals from the remote location of Pyramiden, a long-abandoned Russian settlement in the Arctic archipelago of Svalbard, the pair (made up of Aggie Peterson and Per Martinsen) decided to embark there for a unique performance in an old auditorium. Dazed Digital: What's the story behind using the name Frost? What have been the biggest changes musically since Rune Lindbæk left the project? Frost: It was Rune Lindbæk who came up with the name Frost, really. It's a beautiful word that in many ways sums up our origins. However, today there are a number of other Frost bands or artists, and to clear up the confusion we now spell Frost with an inverted R (inspired by the Russian/Cryllic alphabet). Music is a very personal thing, and will always reflect personalities involved, so now, Frost being a duo, it reflects our mutual creativity. Aggie continuing to bring her input and Per bringing his experience gained from his own Mental Overdrive project amongst others to the table. Hopefully the sum is greater than any of its parts separated. DD: How has it affected your life after being in Pyramiden? Do most people in Norway know about it and do you think it is a dangerous place? Frost: To be honest, it almost feels as if we are the ghosts ourselves, now that all that is left, is fresh footprints in the dust. That being said, it was a bit of a dream come true, and it feels almost unreal thinking about us actually doing it - almost dream-like. Pyramiden is a very special place and very remote. For most Norwegians going to the North of Norway is exotic. Going to Longyearbyen is very exotic. Going to Pyramiden can only be surpassed by going to the moon. As for dangerous, the entire area is a place where you potentially can get lost, freeze to death or get killed by a polar bear - so you of course need to take some precautions. DD: How did you attempt to interpret the feelings harboured in this place in your music? Frost: We have been fascinated and inspired by Pyramiden for years, before making this album. Firstly, because the vision of the whole place, is a beautiful thing: a self-contained society, in total desolation, where the centre of the town design is the cultural house, filled with music, arts, sports and recreation. Secondly, our personal history with Aggie's grandparents (Herta Grøndal and Leif A. Grøndal) documenting this society from the 1960s to the 1990s - and Per's family rooted in Arctic hunters and explorers, makes this place worth exploring, for personal reasons. Thirdly, we've also been confronted with a story about ghost radio signals from the past, being transmitted from this very place. All these things are being reflected in the new album. DD: What do you think will most likely happen to Pyramiden in the next 10 or 20 years? Frost: It seems that many people asks this question. For the Russians they hope for it to be up and running again, as this is a beautiful place they are proud of and have good memories from. For every visitor going there, new infrastructure must be done, hence the visitors are part of making the "ghosttown" less ghostly. Many people show an interest for this place, and Trust Arcticguol (the Russian Coal Miner Company who owns Pyramiden) are planning on improving the hotel Tulipan so they can take more guests. So maybe Pyramiden gradually will become more and more alive? Poltically, the location of the whole island of Spitzbergen is a central place for natural resources (fish, oil) and maybe in a few years for boat traffic, as the ice melts and new passages opens. So, it's a very interesting place to pay attention to for the future. Frost: We are just really excited about releasing the new album, Radiomagnetic, and doing more gigs (this time in less desolate places). We're looking forward to stay in London for a month (we love London and will play a gig there in the end of October) and we're looking forward to present the film and footage from the event we did in Pyramiden. Radiomagnetic is out now. Frost will be playing Queen of Hoxton, in London on October 24th. Check the upcoming November Issue of Dazed & Confused for the full feature.